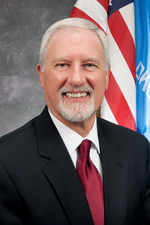 OKLAHOMA CITY -- Effective August 1, 2013, several organizational changes will take place which reflect the leadership of Director Ed Lake and goals in a new agency strategic plan. Ronald Baze, assistant attorney general with the Office of Attorney General Scott Pruitt, has been selected as the new General Counsel. Baze will remain an employee of the OAG while serving under contract as the head of DHS Legal Services. He will begin his duties as general counsel August 12. Lake has created a new position, the Director of Communications and Community Relations, and has appointed Sheree Powell, the current Coordinator of Communications, to this role. Powell will oversee the Offices of Communications as well as Community and Faith Engagement, and Information and Referral. In addition, she will also manage Provider Relations. “This is a move to enhance our engagement with community partners, volunteers and contract providers,” said Lake. “I heard over and over during my listening sessions and through subsequent encounters with our partners that we need to have better communication and more cooperative relationships with them. This has emerged as a major objective in our agency’s new strategic plan and I have asked Sheree to work with all programs agency wide to improve upon and build those relationships. “The combination of these particular offices is a natural fit since their responsibilities are so intertwined with one another. This was also a great fit for Sheree. In addition to being an experienced communications director, she also has an extensive background managing provider relations and building community partnerships,” Lake said. The current functions of Finance and some Administrative Services will be moved under a new Director of Finance and Administration. Lake has appointed David Ligon to this position. Ligon is currently the Interim Director and former Chief of Staff with the Department of Rehabilitative Services. Beginning with DHS August 19, Ligon will oversee all finance functions of the agency as well as Support Services and the Office of Business Quality. Director Lake has decided to move Child Care Services under the management of Jim Struby, Director of Adult and Family Services. Adult Protective Services is being moved to Community Living and Support Services under the management of Mark Jones. APS will be a free-standing program joining the ranks with Aging Services, Developmental Disabilities Services, and Child Support Services. 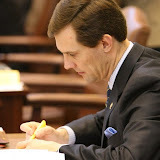 “This move just made sense since APS serves both people who are aging and people with developmental disabilities. Mark Jones will bring a valuable perspective to the work in APS from his previous work with the Office of Client Advocacy and his successful litigation experience with the Homeward Bound vs. the Hissom Memorial Center lawsuit,” Lake said. Director Lake has created another new position, Chief of Staff, and is in the process of filling that position. The Chief of Staff’s responsibilities will include management of Human Resources and the Offices of Intergovernmental Relations and Policy, and Planning, Research and Statistics. A new organizational chart is currently being developed to reflect these changes and will be posted to the website in the near future.